Good news, people who use technology like real-life 21st century humans: you’re finally going to see more Formula One content on your social media. F1 teams have been allowed to post short videos from the first week of testing. Best of all, this relaxed attitude towards mundane technology is expected to stay around. Motorsport.com reports the commercial rights holder for F1 contacted teams this week and let them know that they could shoot short-form videos for use on their social media channels during the test days this week, which last from Monday to Thursday at Circuit de Barcelona-Catalunya. F1 was recently sold to American company Liberty Media, and many fans have clamored for the series to take a more sensible approach to social and online media. Fortunately, Liberty Media has echoed these concerns thus far, committing to improving F1's digital presence. While the easing of social media restrictions is just for the first week of testing for now, more concrete, long-term content guidelines are expected soon, according to Motorsport.com. 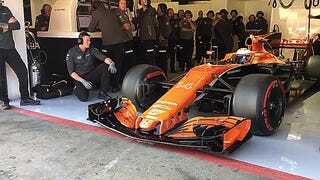 We haven’t been able to follow along with much of the action from testing in previous years because Formula One had locked down any and all video recording within the circuit. Driver Lewis Hamilton infamously got in trouble for posting Snapchats—brief, throwaway Snapchats, for Pete’s sake—from inside the paddock. Any other series would have thanked him for interacting more with his fans, but not the weird, walled-off F1 of yore. Teams have already started to post short clips of their cars in action, and for once, we general-public-types get earlier access than ever to how the cars look and sound on track. Here’s a selection of clips from testing so far. Which car is your favorite?